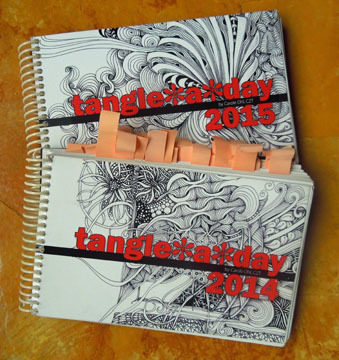 In a previous post, I mentioned that I like to start each day by drawing in my Tangle-a-day Calendar book. 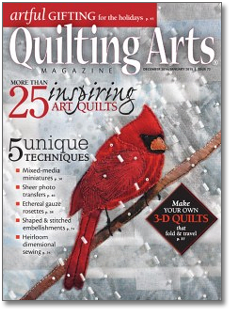 The coil-bound calendars are created by Carol Ohl, another Certified Zentangle Teacher (CZT). They are portable at 8″ x 5″ and are made of sturdy, smooth paper stock that is really nice to draw on. I can use a variety of pens, pencils or slightly wet media to change up my pages. Spiral bound, the book pages have the numerical date and boxes for up to three days on a page. At the beginning and end of the month, Carol has included tangles, step-outs, and Zentangle inspired drawings called ZIA’s. Sure, you could create your own book, divide up the pages or not, and do some daily drawings – but I know I wouldn’t. For some reason, I have not yet been able to sustain a daily sketchbook habit. Usually, I am able to keep up with the Tangle-a-day calendar. I currently have two books going – one for 2014 and the current one for 2015. I fell behind several times in 2014 so I’m still playing catch up. That’s what the orange tabs are in the photo above. I’m down to about 30 days to finish my first book and it has turned into a priceless personal source of ideas for future projects. It also makes me realize that I should get on with a daily sketch habit that isn’t Zentangle inspired. What daily art habits do you follow? Are you signing each of your art pieces? Even though you know you did them, who will know who created them years down the road. Will your distant relatives know? If you keep a sketchbook of any kind, have you added your name and contact information in case it gets misplaced?